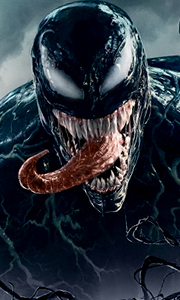 Own Marvel Kawaii - Venom Mug from Deff, DVD, Blu-Ray & 4K Video Specialists - Free UK Delivery..
Own Venom - Face Mega Mug from Deff, DVD, Blu-Ray & 4K Video Specialists - Free UK Delivery..
Own Venom - Face Mug from Deff, DVD, Blu-Ray & 4K Video Specialists - Free UK Delivery..
Own Venom - Face Travel Mug from Deff, DVD, Blu-Ray & 4K Video Specialists - Free UK Delivery..
Own Venom - We Are Venom Doormat from Deff, DVD, Blu-Ray & 4K Video Specialists - Free UK Delivery..
One of Marvel’s greatest and most complex characters takes center stage as Eddie Brock (Tom Hardy) becomes the host for the alien symbiote Venom. As a journalist, Eddie has been trying to take down the notorious founder of the Life Foundation, genius Carlton Drake (Riz Ahmed) – and that obsession ruined his career and his relationship with his girlfriend, Anne Weying (Michelle Williams). Upon investigating one of Drake’s experiments, th..
Own Venom - Black and Bold Black Mug from Deff, DVD, Blu-Ray & 4K Video Specialists - Free UK Delivery..
Own Venom - Comic Covers Mug from Deff, DVD, Blu-Ray & 4K Video Specialists - Free UK Delivery..
Own Venom - Symbiote Symbol Mug from Deff, DVD, Blu-Ray & 4K Video Specialists - Free UK Delivery..
Own Venom - Tearing Through Mug from Deff, DVD, Blu-Ray & 4K Video Specialists - Free UK Delivery..